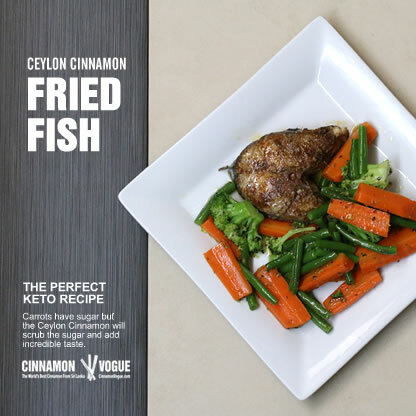 This Cinnamon fried fish is very tasty and so simple to make. The key is a nice slice of King Mackerel and Ceylon Cinnamon powder that infuses it with a lovely slight savory taste. We fried the fish in a genenerous portion of Coconut oil which is the good fat you need to loose weight. So it is all healthy. Paired with butter fried carrots and Broccolli with dash of Oregano it is the complete Keto diet friendly meal. Mix the Ceylon Cinnamon powder, Hungarian Paprika, black pepper and salt in a small spice dish. Do not worry about the amount of salt. You need it. Rub the spice mixture onto both sides of the fish. Heat 3-4 tablespoons of coconut oil in a man. About 5 minutes. Add the fish and fry each side for 4 minutes. Steam some carrots and Broccolli. Remove from pain, add a generous helping of Ghee Butter onto the pan, salt, and a dash of pepper. Add the Carrots and Broccoli onto the pan and saute for 3 minutes. Sprinkle some Oregano and sute for a further 1 minute. Plate it with the fish and serve.